Yes, Food And Wine Pairing For Everyday Dishes Is Possible! Food and wine pairing seems mysterious, and attempting to pair everyday dishes seems downright impossible. Wine, we think, is for the "sophisticated" crowd, all we are having for dinner is macaroni and cheese! Somewhere in the back of our minds it just seems silly to drink wine with our lowly dinner. Even if we are having something slightly more upscale, such as a bowl of chili (OK, more upscale in that it has meat in it), still, it just seem like a crazy idea. But there is no reason to think this way. We can pair any dish we want. No one is going to slap our hand if we try to have a glass of chardonnay with some fried chicken, which I think would go together just fine. 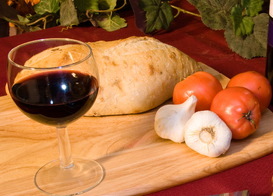 Remember, the same rules of food and wine pairing apply, even with everyday dishes. If you are having friend chicken, it will pair very well with a chardonnay. The fat in the fried chicken will be complimented by the oak and relative high alcohol level of the wine. The same is true for macaroni and cheese. This is a dish with a texture that will coat your mouth. The chardonnay will compliment this texture very nicely. Hamburgers and cabernet sauvignon will be a great pair. The tannins in the wine will go splendidly with the beef and condiments. What about chili? Well, we have talked about pairing spicy foods before, and we have the same principles here. If you want to tame down the spices, go with a riesling; if you love spicy food, and you don't want to tame anything, then go with a zinfandel. It is your choice. And what could be better than pizza and wine! If you are having a pepperoni pizza, Chianti is your choice. Haven't you seen all those straw covered bottles in pizza restaurants? Decoration aside, this wine will be the perfect accompaniment to the strong flavor of the meat and the acidity of the tomato sauce. By the way, the best Chianti, even most Chianti, doesn't come have a straw cover! 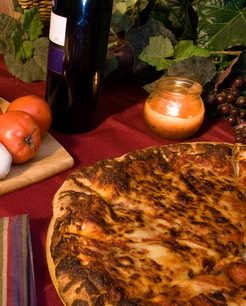 Go ahead, don't be shy enjoy your wine, even with a frozen pizza.